Do you have a dream home floor plan? 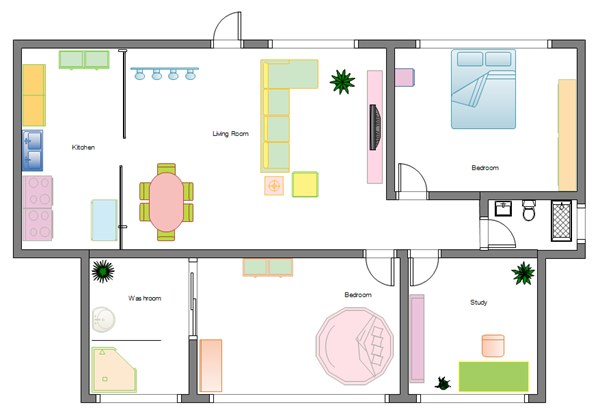 You can design your home floor plans easily without any previous experience if you give floor planner a try. Most of people mistakenly think that it is impossible for them to draw floor plans on their own, so they hire professionals to help them. The truth is that designing home floor plans can be quite easy and needs no previous experience if you choose the right home floor plan software. For most of us, building a home is an once-in-a-lifetime endeavor. Consequently, a good home plan is crucial. Below are some useful home floor plan design tips, which we believe will be great help to you when you start to design your own home floor plans. Moreover, learn house floor plan design here. Brainstorm your ideas. Make lists of features you want each room to have - just get your ideas out of your head and onto the brainstorming diagram. Start with the basics: the number of bedrooms, the number of bathrooms, the number of family areas, the choice between a formal dining room or a more open, community eating area, porch or deck styles for your home's entrances and the size of your garage. Think about the future. Do you have or plan on having children in the coming years? Do you have aging parents? If so, you'll need to think about accommodating close family members in many different scenarios, such as returning college students, accommodating grandchildren and grandparents, taking care of elderly parents - even accommodating extended family for holiday occasions. Design within your budget. Once your list is completed, compare it to your budget and adjust to fit. This is particularly difficult for first-time home builders. People's eyes get too big for their budgets and in the end they wind up overshooting the mark. Lots of people have no idea how to design a home floor plan. No worries, let me show you how to design home floor plans step by step by using the massive built-in home plan symbols. When you open Edraw Max, then point to "Floor Plan", then point to "Home Plan". Double click the "Home Plan" from templates to start drawing page. From the Walls, Shell and Structure stencil, drag one of the room shapes onto the drawing page. Resize the room shape by dragging the control handles and selection handles on individual walls. From the Walls, Shell and Structure stencil, drag Exterior wall shapes onto the drawing page. Resize walls by dragging an endpoint. Drag an endpoint of one wall to another wall. The endpoints turn red when the walls are glued. 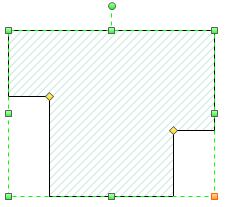 Intersections between two walls are cleaned up automatically. 3. Create the interior wall structure. Drag wall shapes onto the drawing page, positioning them inside the exterior structure. 4. Add other structural elements. From the Walls, Shell and Structure stencil, drag structural shapes, such as columns, onto the drawing page. From Building Core, drag building core shapes, such as stairs, onto the drawing page. After you assemble the building shell and wall structure, you can add electrical symbols and dimension lines. From the Electrical and Telecom stencil, drag wall switches, outlets, and other wall fixtures onto wall shapes. Release the mouse button when a red square appears, indicating that the symbol is glued to the wall. Wall fixtures automatically rotate to align with the wall and glue to the wall. You can also drag ceiling fixture shapes, such as the Ceiling fan, onto the drawing page.